Because nearly all of my printed circuit boards are for one-off homebrew projects, I tend to not obsess over getting the last air wire down on the copper. Instead, I route those pesky all-the-way-across-the-board stragglers on Layer 15 with big fat vias on each end, then solder a jumper wire across the board. In effect, my Layer 15 is outside the board. 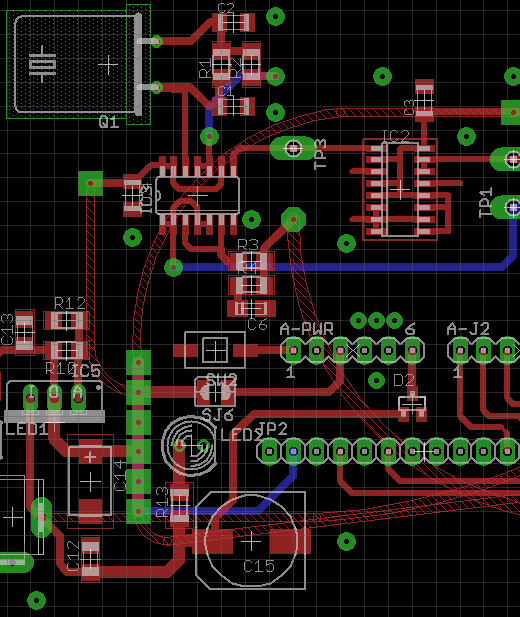 The screen shot shows a chunk of a board with some Layer 15 wires. I make ’em fat and use swooping semicircular arcs on the ends: they’re easily visible. I don’t worry about actually routing the traces; they’re just straight lines and arcs. This generates all manner of overlaps with the rest of the components & wiring, but after I go down through the DRC list and approve ’em all one time, that’s the end of that hassle. I make the vias fairly large (here, 100 mils) and a unique shape (octagonal) so that I know each one should get a wire. I usually wind up doing the power connections the same way; those vias are square. Conversely, ground vias stitching the top & bottom planes together are round; they get a short Z-wire through the board. This probably won’t work if you’re having the boards built by an actual PCB vendor, as they’ll try to make a three-layer board or kick the board out on layout rule violations… but, on the other hand, if you can afford a four-layer board, then most likely you won’t have any trouble routing the wires. This entry was posted on 2009-12-01, 07:56 and is filed under Electronics Workbench. You can follow any responses to this entry through RSS 2.0. Both comments and pings are currently closed. If you’re on the fence about a four layer board, sparkfun’s associated batchpcb.com does four layer boards for $8/square inch. Not cheap, still, but it can be awfully nice to run a ground plane. I like it that Eagle can represent jumpers that way. That’s a great service, but I generally don’t have that much leadtime: many of the boards are for projects I write up in Circuit Cellar, so there’s a hard deadline at the end!